NEW YORK — So it’s a big time for the future of the NFL right now. Owners will meet at the ritzy Waldorf Astoria on Park Avenue here today to set the stage for a team in Los Angeles. A vote for NFL approval probably won't come until January, which would result in a team (or teams) playing a couple of seasons in L.A. (likely at the Coliseum) beginning 11 months from now. But there are some big “buts.” Everyone you talk to around the league warns that the process could go slower, and a franchise may not start playing in Los Angeles until 2017. And that two teams are possible. The biggest issue, honestly, is to manage the disappointment of the one or two teams that do not get chosen, assuming, as expected, that the owners pick a team or teams in January, before the Super Bowl. Today at the Waldorf, expect commissioner Roger Goodell to take a passive role, simply listening to the discussions among the owners and to legal counsel Jeff Pash’s presentation about the nuts and bolts of the relocation guidelines. Goodell doesn’t want to tell owners his preference yet, if he even has one now. In the afternoon, it’s expected the three owners of the teams vying for Los Angeles—Stan Kroenke of the Rams, Mark Davis of the Raiders and Dean Spanos of the Chargers—will be dismissed from the meeting, and the 29 remaining owners will be able to speak freely about their thoughts of where things stand. Miles to go before the NFL sleeps on this one. As the owners dined in midtown Manhattan or did other things Tuesday night—a group of them was in a suite at the Yankees-Astros playoff game in the Bronx—the topic was not far from any of their minds. But a decision is still a good three to four months away. The Miami coaching change was newsy for a while Monday, but then came the controversial end to the Seattle-Detroit game. The decision by Dolphins owner Stephen Ross to dump Joe Philbin and hire Dan Campbell for the rest of the season deserves a few lines, though. It is always a sad thing to see a legitimately good man—and few among NFL coaches are better men than Philbin—but you cannot keep a job in the NFL without winning, or having the prospect of winning in the very near future. Joe Philbin's Dolphins hadn’t won more than eight games in a season in his three years in charge, and the prospect of even reaching .500 this year was exceedingly grim. His forte was offense, and his offense was awful. 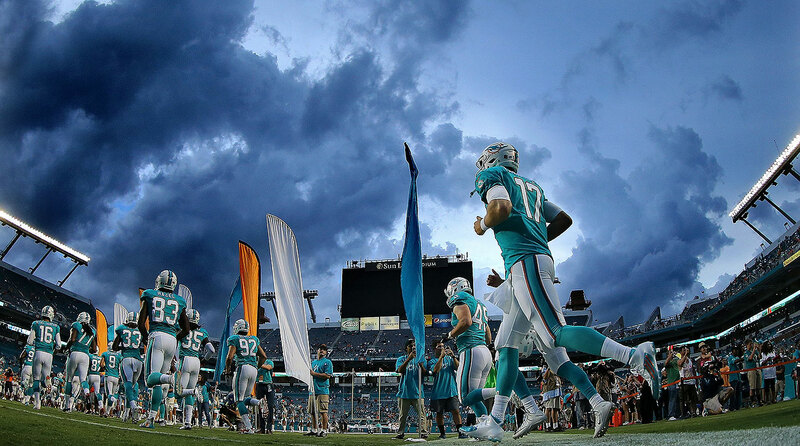 In seven of the past nine Miami games, the Dolphins scored 20 points or less. The defense, where Ross had spent liberally, hadn’t made a play in the first quarter of the season. It was time for a change, if only to give Dolphins VP of football operations Mike Tannenbaum a head start on a coaching search for 2016. Campbell, promoted from tight ends coach to the interim job, played and learned under Bill Parcells and Sean Payton but has never been in position of authority such as head coach or coordinator. Still, I like the choice, because there was no chance for either of the coordinators to earn the full-time gig. Campbell’s different. He may not get the full-time job either, but Tannenbaum, between his Jets and Dolphins jobs, was an agent who represented a bunch of lesser lights, and he learned to like those types. In basketball he repped Steve Kerr, hired by the Warriors, and David Blatt, hired by the Cavs. Those two came out of nowhere to get jobs and ended up facing each other in the NBA Finals last season. Pay attention to this lesson about the Miami coaching search. It could be very important. Miami may not recycle the usual suspects come early January. In June, Tannenbaum told Jenny Vrentas of The MMQB that he’s learned sometimes the iconoclastic route is better when it comes to looking for coaches. On Thursday, we will have some reporting on the exploding industry of daily and weekly fantasy sports in America. Our Robert Klemko, Kalyn Kahler and Emily Kaplan, along with editor Gary Gramling, have been working on this hot-button topic, and their stories will appear on our site Thursday. Many of you have asked us why we have not been reporting about this story yet; many figure that it’s because FanDuel is a sponsor of The MMQB and that we are steering clear of writing about this very newsy subject. We are not steering clear of it. You will have to be the judges, as you always are, about whether we do a good job with our stories or not. I can tell you that no one at FanDuel has spoken to me or tried to influence me in any way about what we are reporting. It obviously is a slippery slope of a story. We will go deeper than the news this week about insider knowledge and address the heavy influence of the site on football coverage and football teams. And I look forward to your reaction to what we write. I always do. You as readers never disappoint me. Now on to your mail. I have temporarily relocated to London on business, and I was fortunate enough to spend a great day at Wembley Stadium to watch the Jets-Dolphins game. 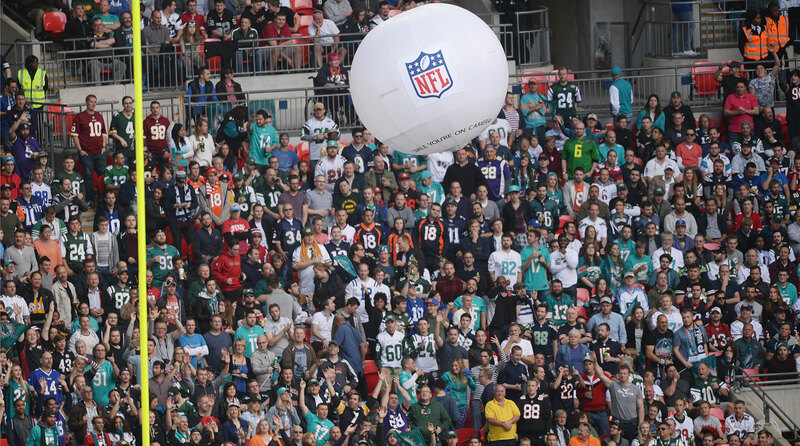 One of the differences at the London game was the wide variety of NFL teams represented by fans wearing jerseys. It was more like a Hall of Fame game than a regular-season game. While I was in line for ale and chips during halftime, I made a note of all of the different team jerseys I could see—24 of the 32 teams were represented within 40 feet of me. This is a city that is ready to support American football! I actually believe that a franchise in London would be a success from the standpoint of building a local fan base and making it work in a foreign country. My big two questions are: One, how fair will it be that one team is on an island at least 3,000 miles away from the next-closest team, with all the inherent problems that entails? Two, wouldn’t it be better for, let’s say, six games with 10 to 12 different teams every year being played in different cities around the globe? Three or four in England, maybe one in Germany, maybe one in Mexico City, maybe one in an experimental place like Brazil or China. But overall, I do think the idea of multiple teams playing overseas annually is a good one. With all of the talk about the potential for a permanent NFL team in London, it seems that an important consideration for competitive balance is being overlooked: the salary cap. Unless the league gave the London team a high salary cap or converted the salary cap total to correct for the exchange rate, that team is effectively going to be working with much less money than all U.S. teams. As of Monday, one pound equals $1.52. Projecting that to the salary cap (currently set at $143.28 million), and it equates to £94.26 million. With such higher living costs in London and the U.S. dollar’s purchasing power being so much lower in London, it would make attracting free agents substantially more difficult. The competitive imbalance could have severe reverberations for the franchise itself as well as for other teams in the division and conference. You make a good point, and it’s a point that NFL owners and people in the league office have already taken into consideration. If a league puts a franchise in London and deems that to entice players to want to play there (and their families to come and put their kids in school) it’s likely that London franchise would have to have a larger salary cap than teams in America. That is not going to be what scuttles this idea. If owners think that a team in London is a potential gold mine, they are not going to let a simple $20 million a year cap increase get in the way. Reports this week seem to be that the NFL will not issue any suspension immediately for Sheldon Richardson, and will instead wait for the legal proceedings to play out before acting. [Richardson, who was already facing suspension for failing an NFL drug test, was arrested in July and charged with resisting arrest and various traffic violations after police say they clocked his car traveling 143 mph on I-64 in Missouri; he has pleaded not guilty.] While there is nothing unreasonable about that, it goes again to the seemingly arbitrary way in which the league hands out discipline. In this case, it doesn't really seem like the legal proceedings even matter—he is certainly going to serve a lengthy suspension regardless of the outcome. Is there any rhyme or reason to the way the Goodell Administration handles off-field issues? And how can the owners possibly allow this to go on? Sheldon Richardson’s offenses, on their face, seem outrageous. We in the media are not told about how such cases are investigated, but the new emphasis on vigilant investigations lead me to believe the league has looked into the case thoroughly. I just wish I knew what league investigators found out. Because as I say, on the surface, Richardson would appear to deserve more than four games. I just don’t know what happened when the league investigated it. Do you see more kickers being drafted after all the issues teams are having? Just 10 years ago people were questioning Belichick's use of a high draft pick on Stephen Gostkowski. But after his perfect month, might more teams adapt in the coming years? The Patriots have had two incredible kickers in the last 20 years. One, Adam Vinatieri, was an undrafted free agent whom New England never wanted to lose but who got too expensive. The other was a fourth-round pick who has been extraordinarily reliable in his 10 seasons with the Patriots. I’m not sure that constitutes a trend. I do believe, though, that teams are going to place more emphasis in the future on kickers who have kicked in intense environments—the SEC for instance—because I think part of the problem is that too many kickers aren't used to the pressure and do not practice at full speed against live rushes. The problem with trying to predict how kickers will do is that many of them have such different personalities and it’s hard to know whether a flat-line guy is going to succeed just because he is seemingly unaffected by pressure. Look at a guy like Justin Tucker of the Ravens. He’s a fairly unemotional sort, who has had all the success in the world. Then you look at Kyle Brindza, the kicker from Notre Dame who appeared to the Bucs to be a steely kid immune to pressure. He missed five kicks in two weeks and got cut. I just don’t think there is much of a science to this. You have to try The Great Pumpcan by Madtree Brewing here in Cincinnati, if you can get your hands on some. And if you get some, drink an extra for me. I'm seven months pregnant and am greatly missing my Sunday afternoon Oktoberfest and pumpkin beers while I watch the Bengals! Every year I search for the best pumpkin beer, and I keep coming back to these two, both brewed here in the Carolinas: Thomas Creek Pumpkin Ale (Greenville, S.C.) and NoDa Gourdgeous (Charlotte). I have been doing plenty of pumpkin beer research, as being a Browns fan has involved a beer or two to keep my sanity. The best one I have had is Pumking from Southern Tier Brewing Co. in Lakewood, N.Y. Thanks to the countless readers who forwarded their favorite pumpkin beers. In total, there were 91 beers suggested (with numerous beers recommended multiple times among the hundreds of responses). It got me to thinking: Let’s have a pumpkin beer contest! So on Friday, at the end of the day, a few staffers from The MMQB are going to get together and try a selection of the pumpkin beers that you have suggested. We’ll have a taste test. We’ll grade all of the beers and, hopefully in a sober fashion, detail the results in my column Monday.